Two months. Six meetings. Five neighborhoods. The Now + There Public Art Accelerator has entered its third month of demystifying the process of creating public art. We met last week in a collaboration with the City of Boston’s A.I.R. 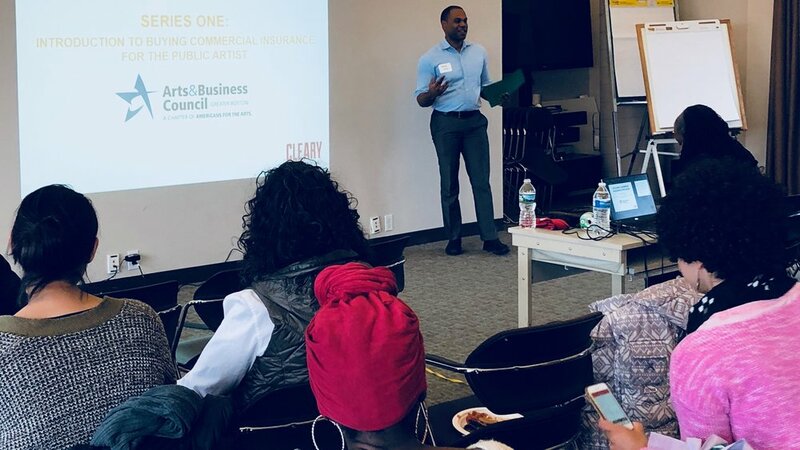 program and NEFA’s Creative City to cover the wild world of insurance and budgeting. After nearly scaring us silly with examples of underinsured scenarios, Chris Hawthorn CPCU, CIC of Cleary Insurance assured us that insurance is in fact, not as complex as it first appears and agents can be an excellent resource for learning about the different coverage needs to meet the varying practices we’re engaging in – from social practice artworks, to monumental, international sculptures. Not to mention how coverage needs will change as we tackle more complex projects — from workers comp for the first time we hire a studio assistant, to the $1-5M umbrella policy necessary when we land that big project with a developer, to inland marine policies needed when we start moving that artwork from city to city. David Holland of Arts & Business Council of Greater Boston introduces the topics of the session. We must understand what we're agreeing to in our contracts and verify that our insurance policies cover those agreements. That’s why having a good attorney is helpful. Find someone who can read your contract and confirm that you have the right coverage. It is not the job of your insurance agent to interpret a contract. And lastly, we can’t rush the insurance process to make that midnight RFP deadline. So, start that conversation today with your broker. Or at least have a good contingency in your budget to cover the unknowns. How much is standard for a contingency in a budget? That depends on the scale of your work. Jim Grace, Executive Director of the Arts & Business Council of Greater Boston facilitated a panel on budgeting with Creative City alumnae Silvia Lopez Chavez, Sarah Rodrigo (Studio Manager for Ralph Helmick Studio), and artist Doug Kornfeld. What became instantly apparent is how budgets reflect the business models and people we work with, and how much risk each artist is comfortable taking. For instance, Kornfeld prefers to keep his budgets under $100k so he can manage the process on his own. That way he avoids subcontracting, 1099s, and the need for worker’s compensation insurance. A rich dialogue about artist fees surfaced more than once during the panel. While the artists varied on the percentage of the budget they save for an artist fee (e.g., 10-20%), all agreed that it’s a necessary part of the budget and a line item all clients should see. Forgoing an artist fee, or burying it in a supply line item, does a great disservice to fellow artists. It devalues our time. What is an appropriate artist fee? How do you value your time and your work? Does it vary depending on the size of the budget? Does it depend on who you’re working with? We’d love to hear from you in the comments below. What's the value of your time and your work? Newer PostMeet our newest Board member! Older PostJoy and Transgression: Reflections on "Slideshow"